The Neo-renaissance building on Namesti Miru is work of the architect A. Turek. The National House was opened in 1894 and it became the seat of many associations and corporations. The first reconstruction lasted till 1959. These days, the building is after a big interior reconstruction and reconstruction of the building facade was finished in 1999. The halls and saloons of The National House of Vinohrady are suitable for arranging of congresses, seminars and work meetings, customer meetings, sales and contacting exhibitions, performances and concerts, balls and company parties, banquet and other social and cultural activities. Majakowski Hall is the most representative space of the National House of Vinohrady. The decoration contains also 18 busts of significant Czech personalities. Rais hall is the classic example of neo-renaissance interior. Social hall is a former winter garden with a glazed ceiling. There are small heads in the Art-Noveau style besides other decorations. 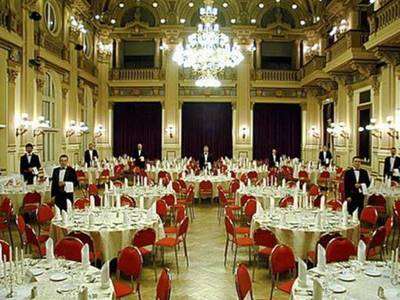 The capacity of the Majakowski Hall is 300 people in banquet style.